Tapok Hostel i Chisinau, Moldova: Bestill nå! Hey guys! Looking for a place in Chisinau to chill out and make new friends? So this is the right place for you. We know exactly what you are looking for: we promise we will make our best to make your travel a unique experience. Our hostel was recently refreshed and repaired. You have a opportunity to try our new mattresses and linen. Dorm rooms have new designed walls which will make your holidays in Tapok brighter and more comfortable. Terrace is always ready for barbecue and evening parties with a glass of a good Moldavian wine and sheep cheese. Just be ready for a nice vacation and relax! We like to enjoy our terrace in evenings when all guests can sit around table in a cheerful atmosphere and speak their trip stories. Tapok is a good place to meet new friends and interesting companies. If you are lucky than you can meet Jean Mark, our french friend who became the part of Tapok family. He is a perfect french chef and artist so it's a must to try his barbecue and genuine sangria. We have absolutely the best location in the heart of Chisinau. Were right on Armeneasca street in the historical city center. You'll be located within walking distance of all the city action. Were also close to the bus, trolleybus and minibus stops to get around Chisinau. Tapok is an oasis for backpackers, featuring all the amenities, activities and events that travelers truly want. This includes friendly staff to help you, a fun international crowd to hang out with, cool rooms, a great vibe, weekend events and activities that supply lots of fun for free or very cheap. 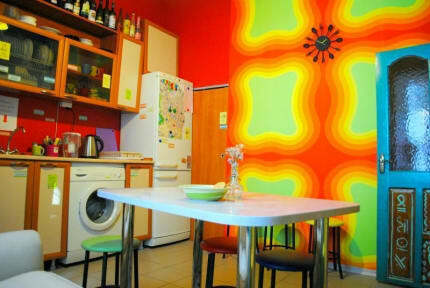 This place was just an old yellow house that has been remodeled into a colorfull nice-designed hostel. Each of our dorms has four-to-eight beds plus two shared bathrooms to escapre queues and a guest kitchen. There are free lockers in every dorm as well as free white linen, towels and free luggage storage. Wooden beds are custom handmade with very comfy mattresses, personal lights, hangers and power sockets. You will feel yourself like at your home and sleep like an angel! Our outdoor common space is fantastic, featuring a huge, warm and welcoming courtyard that has music, grill, trees and flowers. You can always enjoy your refreshments and a barbeque with sunbathing and cold beer in a cool company. Relax and get to know your fellow travelers (a fun international crowd) at our free BBQs and gatherings. There is also a kitchen available where you can cook and have a meal in a favourable atmosphere after a day's sightseeing. There we also have free snacks, coffee, tea, species, cereals, butter and bread. A free parking for cars and bikes, free calls in Moldova. So tons of freebies for our guests! All of our rooms are kept very clean according to the high standards of housekeeping. Stay in touch with those from home using our Internet connection and free Wi-Fi. Also always use our PC for your needs. Our staff is attentive, positive and open for commuication and helping you with all your questions. They provide you all the necessary information about main turistic attractions, local interesting places and many other. They can help you get any direction you chose to go in our sunny country, just let us know what you want to see and well explain you how to reach it the cheapest way! Here you'll find friendly young atmosphere and homeliness. Best of all, theres no curfew and no lockout! We gave you your personal key which you can use at any time you arrive back from parties in the city! Here at the Tapok Hostel, we treat all of our guests like family. We offer a perfect combination of good value, convenience, comfort and hospitality. Traveling alone or in a group, come to explore the cultural side of Chisinau as well as the night life and the surroundings! Stay with us in Chisinau! You'll be excited!